Wilbur Joseph Cohen, Under Secretary of Health, Education, and Welfare, wears many hats, including those of legislative expert, student of politics, administrator, educational policymaker, advisor to Presidents, congressmen, and governors, and college professor on leave of absence from the University of Michigan. "After all his years in the Capital, Cohen has lost none of his humanitarian glow-'as though,' an acquaintance once said, 'he feels every person in the country who is home alone sick is his personal responsibility.' "
The Milwaukee-born, University of Wisconsin-educated Under Secretary has been characterized by Medical World News magazine as "The Man Who Built Medicare." Publisher Maxwell Geffen goes on to state that, "Obviously, Wilbur Cohen doesn't run every facet of the medicare program. But he is largely responsible for putting the pieces together . . . and working incessantly for a rapproachment between government agencies and the medical profession." In his book, "A Sacred Trust," author Richard Harris, in writing a history of the 30-year battle for passage of health insurance legislation, attributes to former U.S. Senator Paul Douglas of Illinois the following: "A Social Security expert is a man with Wilbur Cohen's telephone number." 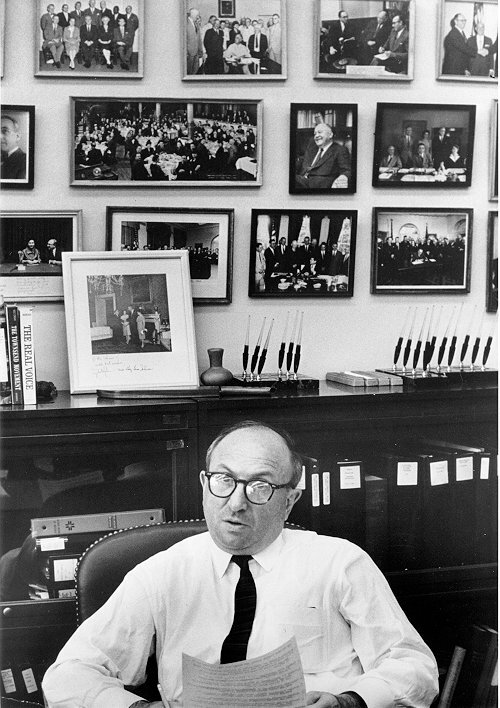 The Wilbur Cohen story and the activities that have made his name synonymous with HEW legislation have their beginnings in 1934, when at age 21 and fresh out of the University of Wisconsin, he came to Washington as research assistant to his former professor, Edwin Witte, who had been appointed Executive Director of President Roosevelt's Cabinet Committee on Economic Security. This meant working closely with such distinguished social welfare exponents as Secretary of Labor Frances Perkins, and Arthur Altmeyer, who went on to become chairman of the Technical Board which drafted the bill that was destined to become the Social Security Act of Ik35, first chairman of the Social Security Board, and Commissioner for Social Security. Mr. Cohen proved to be a good learner and a persistent innovator. Though out of school only a few months, he became one of the drafters of the original Social Security Act and then joined the Social Security Board as technical adviser to Mr. Altmeyer. Subsequently, the young man from Wisconsin became Director of the Bureau of Research and Statistics in charge of program development and legislative coordination work with Congress. From 1956 to 1961, as Professor of Public Welfare Administration at the University of Michigan, the social security expert often served as a consultant in many areas of health, education, and welfare. He has also, over the course of years, authored a number of books and articles and received a number of awards for distinguished service in the welfare and social security fields. In 1960, President-elect John F. Kennedy named Professor Cohen to head up a Task Force on Health and Social Security which would make recommendations for improving national programs in these areas. Shortly after taking office President Kennedy appointed Mr. Cohen Assistant Secretary (for Legislation) of Health, Education, and Welfare; and, in 1965, President Johnson elevated him to the Department's number two post, UnderSecretary. This photo was taken in 1965 at the time that Cohen was Undersecretary of the Department of Health, Education & Welfare. Notice the many ceremonial signing pens on his bookcase and the plethora of photos on the wall behind him--almost all of which relate to the history of Social Security. Photo by Rowland Scherman, Life magazine, copyright by Time-Life, used by permission. Of the total legislative program sent to Congress by the President in the past 5 years, more than half the major bills enacted have come out of HEW where Mr. Cohen and his staff have worked long and hard on legislation to bring about many and varied programs. And this legislation runs the gamut of all DHEW activities, not confining itself to medicare, liberalizations in social security, or problems in welfare. When it comes to legislation, Wilbur Cohen is just as intense with such topics as school dropouts, protection of the consumer, Indian health, compliance by school districts and hospitals with Title VI of the Civil Rights of 1964, appropriation for the Public Health Service grants, budgetary needs of St. Elizabeths Hospital in Washington. How does he do it? Well, several factors enter into being a successful legislative innovator. First, Cohen makes sure that key persons inside and outside of Government concerned with any aspects of the bills are consulted and given an opportunity to express themselves. He takes advantage of their ideas to get all possible force and drive behind the bills. He is flexible and imaginative in getting around what seem to be impasses. He compromises without surrendering his ideals and, through person-to-person diplomacy and force of logic, converts many opponents to his side. He is fond of quoting his father, who still runs a variety store in Milwaukee. Says the Under Secretary: "He taught me to look at things from the view of the fellow who's buying the merchandise." Medical World News gives this description of what makes the Under Secretary tick: "Those who have worked with Cohen regard him as one of the most cooly efficient, pragmatic, and persistent innovators Washington has ever seen. They view him as a man committed to social justice, one who knows his way through the Capital's jungle of politics and bureaucracy. And they have an abiding respect for the breadth and precision of his technical and sociological experience." The bouncy, energetic, indefatigable Mr. Cohen, will go just about anywhere, either to rally support for a piece of legislation or to attempt to convince opponents that the cause is just. Whether it's the 1967 Washington Citizenship Seminar sponsored by the YMCA-YWCA, a conference on Social Welfare and Alcoholism, a meeting of the National Medical Association, or a group of senior citizens, Mr. Cohen will speak out loud for what he believes and ask others to join him. Any member of his staff will confirm that his day starts early, ends late and doesn't have a dull moment in it. If variety is the spice of life, Wilbur Cohen is one of the more seasoned men in Washington. Arising at 6:45 a.m., the 54-year-old UnderSecretary might start the day off "on the Hill" where he breakfasts with a group of congressmen who have asked him to discuss a legislative proposal. Then it's back to the office where, in rapid fire order, there's a draft of a speech to check, telephone calls to and from the White House, committee chairmen, Senators, congressmen, and organizations like the AFL-CIO, American Medical Association, and American Hospital Association, interested in what HEW is doing and that their concerns, often conflicting, are recognized. There are memorandums to write and respond to, conferences with Secretary of HEW John Gardner or other Departmental officials, on legislation, program, budget. "UnderSecretary Cohen's day is a series of crises, any one of which could overwhelm him if he let it. But he has the amazing ability to grasp a problem quickly, get things rolling toward a solution, and move on." Coming out of school in the midst of the great depression imbued with the "Wisconsin idea" of social justice extolled by John R. Commons, Professor of Economics, and others, Wilbur Cohen started fast and never slowed down. He's left his mark and there's more to come.